From 1960 till 1974, Carolyn Tannock (nee Noble) graced our television screens in Western Australia, except for interruptions for her wedding, honeymoon, childbirth and valued time dedicated to her own brood. 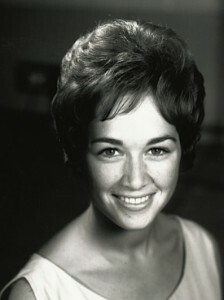 For much of Carolyn’s career at TVW was devoted to entertaining children, starting in April 1960, at the youthful age of 17 and a half. A time when Rolf Harris was hosting Children’s Channel Seven, and Walt Disney’s Mouseketeers were all the rage. So popular was this imported children’s program that TVW decided we should have a local version too. The hunt was on for a vivacious and articulate young lady who became synonymous with celebrity to the young viewers of Perth. By coincidence, Carolyn’s parents were friendly with Jim and Sheila Cruthers, and during a family holiday at Rottnest, Carolyn looked after the Cruthers’ young children, John and Susan. Particularly Susan, at the Basin, at Rottnest. 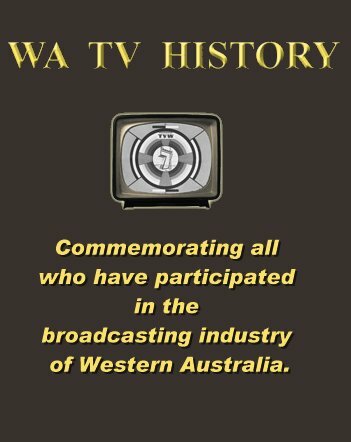 Jim Cruthers was to become the person responsible for the successful application for Perth’s first television station and then the founding General Manager of TVW. When TVW interviewed girls for the first Children’s Channel Seven hostess, Carolyn who trained as a secretary, was called in for an interview . She was one of about eight, and most of the others had come from an elocution studio. Carolyn didn’t, though she was taught elocution at school. Coralie Condon interviewed the girls, and had a little chat. There was no apprehension at the time, as Carolyn’s household was without a television set. Very shortly afterwards they rang and told Carolyn that she got the job… which Carolyn described as fantastic. So they came and took a photograph of her with the mouse ears on, and wearing her sister’s dress. Carolyn started work at TVW as a secretary at 10 o’clock in the morning and wore the same uniform as all the other girls at Channel 7. She mainly typed envelopes in the office, then around 4 or 4:30, would go down and take off her blue uniform blouse and put on her yellow T shirt, with ‘Carolyn’ emblazoned across the front. Carolyn’s first segment on TVW followed Rolf Harris, and was 15 minutes in duration. This consisted of about 15 children who came in and sat at the Mickey Mouse Club house and were interviewed on-air by Carolyn as their parents watched from home. Carolyn was chief Mouseketeer to 25,000 mice. Carolyn also went down for an Ashton Circus appearance and a lion got loose and finished up in a balcony in Terrace Road. “When Rolf went away, we were going to be hosts of Children’s Channel 7, and Jim Atkinson had joined the station, with Judy Lee a part of that for a short time.”, explains Carolyn. 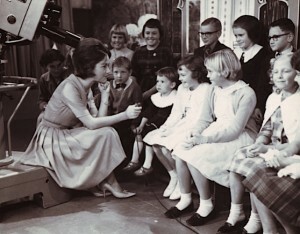 “We hosted this wonderful Children’s program which was produced by Penny Hoes, who came from England, and she was a fantastic producer, and it was a very interesting and educational program for children.” Five to ten minute segments and then Carolyn hosting in between, with live commercials within all of this… and then the Mickey Mouse show at the end of it. One year there was a different theme for every day on Children’s Channel Seven. She had a wonderful pink dress made for Carolyn’s castle, and wore a tiara. There were five themes and five different outfits. Carolyn said that Lloyd Lawson and her had a good relationship. She used to help out on the Today show, Audrey Barnaby helped out too, it was a 2 o’clock show and she didn’t have to wear the mouse ears or T shirt, so she dressed in really nice clothes. They had an audience of ladies… it was a good fun show and they had lots of laughs. Lloyd was much loved by many, many women… he had a great following. Fond memories for Carolyn. On one memorable occasion Audrey Barnaby was marrying Geoff Long and Gary Carvolth and Carolyn were invited to the wedding but only got back to the studio at 5 minutes to 5… just minutes before the live Children’s Channel Seven. This cause a bit of stress for the production team at that time. Televisit was Coralie Condon’s program, that was a Wednesday, and Carolyn did a little bit on that. That was a very informative program and Coralie had wonderful people who would come along for various segments… some were regulars… some were not. Carolyn reports that, “Coralie was also the producer of our program. That is the Children’s Channel Seven early days.” She organised Pat Thomas who did the pets, Harry Butler did the nature segment, Len McKenna did wildlife, Scott Proper-John with hobby time. Scott was brilliant as he had every kid in Western Australia making models with pop sticks.” Carolyn wonders, “I think today that if you look back on one of those Children’s Channel Seven programs, you would think holy moly what is this… school or something… it’s just all informative. Very little fun and dance.” Everybody thought it was great at the time, because that’s all there was. It certainly was a good program. TVW gave Carolyn a trip to Victoria to appear on children’s programs there, and it was an amazing trip at the time, she had never flown in a plane, apart from Rottnest, and Coralie came too as her chaperone, and they stayed in this fabulous hotel in Melbourne. Carolyn appeared with King Corgi and read stories… and also appeared on In Melbourne Tonight… unfortunately it was the night when Graham Kennedy wasn’t the compere… “But I do remember Graham Kennedy gave me a lift home in his Mercedes… which was a very good story to bring back from Melbourne”, reports Carolyn. TVW also gave Carolyn an air fare to England on the first Air India trip out of Perth. She was away for three months, it was wonderful and still talks about it. 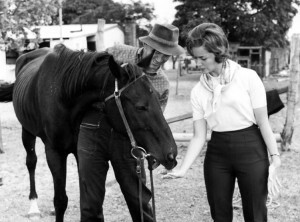 In 1964, Carolyn Noble and Gary Carvolth won the best male and female personality Logie Awards for Western Australia. Though at first Carolyn had to wear her own clothes, TVW later provided a budget and Neil Hunsley (the brother of TVW’s Jean Hunsley) an excellent dressmaker and designer, created her wardrobe. Carolyn recalls that Brian Treasure treated her like a daughter, and made her feel very special. She thinks that Brian was the vision behind very many good things that happened at Channel 7 in the early days. Carolyn remembers going in to see him one day and her hand was shaking so much when she showed him her engagement ring. When Carolyn and Peter Tannock announced their engagement, the Daily News reported that a noble was to wed a royal, as Peter played for the East Perth football club. They married in 1965. Then Carolyn moved to America and had a baby… she went for two years and that was the end of that section of her television career… which she considered a great job, it was easy, and quite well paid for a secretary. Trina Brown then took over Children’s Channel 7. While Carolyn and her husband were in America, living in an apartment block opposite the university, they could see the armed National Guard attending to the riots, after the death of Martin Luther King [on April 4, 1968 (aged 39)]. 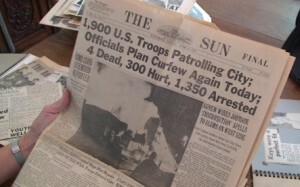 She brought back a copy of The Sun, a Baltimore newspaper dated 8th of April, with the headlines, “1,900 U.S. Troops Patrolling City; Officials Plan Curfew Again Today; 4 Dead, 300 Hurt, 1,350 Arrested”. It was such big news that Darcy Farrell rang her from TVW and interviewed her on how it was affecting them. On returning from the US in 1968, her second baby was born soon after. 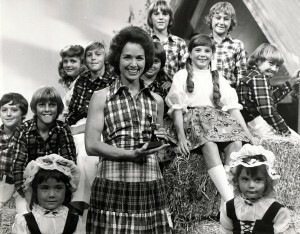 Carolyn returned to Channel 7 in a Saturday morning children’s show which contained a young talent quest, with a judging panel, of which one was Coralie Condon, and there was Max Kay too. This evolved into Stars of the Future. Patricia Stephenson was an exquisite young singer on an early version of Stars of the Future. It was originally shown on Saturday mornings, but later moved to a family viewing spot at 7pm on Thursday evenings. It was recorded on Saturday mornings. The talent show would run through the year and finish up with grand finalists. None of them ever made a big mark on Australian music, but it had a great following here, and it won a logie too (four in total as Sandy Palmer continued on with the series). Carolyn thinks the show started about 1970, and in May 1971 it went to prime viewing time. Carolyn finished in 1974, when she was pregnant with her fourth baby, Sandy Palmer stepped into her shoes, taking over Stars of the Future. 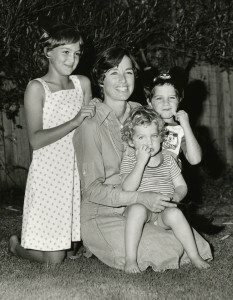 Many young male hearts were broken when Carolyn became engaged and then married, and Perth television screens missed her bubbly presence when she finally retired to family life. I know that Australia was the longest first run of the original “Mickey Mouse Club”, of which I was one of the nine who lasted the entire filming BUT I have always heard it ran for 12 years (1955-1952) but one book has it at 14 years. Which is accurate? 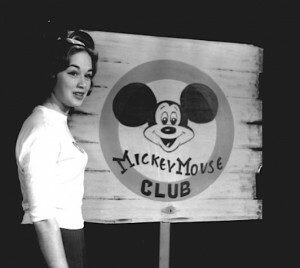 Great to have one of the original Mickey Mouse Club Mouseketeers viewing our web site. Was surprised to learn that Doreen was involved in risque photo shoots for Frank Zapa… but she was a big girl by then. I thought she was rather cute in the MMC days, and still looking nice today. The Bill O’Reilly interview on YouTube with you and Doreen was a good flashback, and I’m sure we all have fond memories of that period. I know I enjoyed it as a viewer, being a TV highlight in the early years of television in Western Australia. TVW Channel Seven’s late Brian Treasure became friends with Walt Disney, who allowed TVW to mount Disney on Parade in Perth, Western Australia in 1971. The show was then recorded and became one of the Disneyland programs. The show then toured throughout Australia and Asia. A number of similar shows followed as co-productions with Disney. Brian Treasure’s son Bret and widow Jocelyn are now part of the committee planning the 50th anniversary reunion of the station, which takes place on October 18th this year. 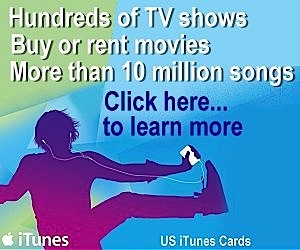 I recommend viewers visit your web site at http://www.mouseketeerlonnieburr.com/ and check out your video links to relive those wonderful days. hi.i just happened to type in childrens channel seven with carolyn noble in the 1960’s and this fantastic site came up..
what a great piece to find. i have been trying to work out when myself and my brother were on the show,and i am sure it was about sept/oct of 1963,when taffy the lion was on there. if anyone can help me out here i am wondering how to go about getting a tape or dvd of that show so as to give it to my brother next feb for his b-day,………any takers???? and does anyone know what i am talking about??? help would be greatly appreciated. hope to get a reply. Why on a sunday morning in Albany all these years later I looked up Carolyn Noble I don’t know. I was in the 1st Yokine Air Scouts with bugle and drum band both started by a George Hayhurst. We went to the 7 studio and played there. I counted 32 spotlights on us.. hot! We met Carolyn Noble lovely lady. I still have the mickey mouse club badge that we were all given. This was about 1960 ? Yes Alfie, it was about 1960. I do recall that time we were on Children’s Channel 7. I was the Base drummer in that band. It was hot. We were in uniform – grey shorts, long socks scarf & beret etc. We also played at our school – the Yokine Primary School at assemblies and fetes. Strange to think that 7 years later I would be a cameraman in that same Studio. I was also on childrens channel 7 with my 2 brothers and sister. I think it was around 1966. It would b so fantastic to obtain this footage. I was only about 7. Can anyone assist ? Thankyou. I was on the Children’s Channel 7 television show, as a child. I remember partisipating in a question and answer portion of that show. I’m not sure which part of the show it was named. It was around 1960s sometime. Rolf Harris and I think Carolyn Noble were there. Also, I auditioned, (singing), in front of Coralie Condon, when I was a little older maybe pree teen age. Many years latter, in a different town, I modeled in a charity parade hosted by Jenny Clemisha, now known as Jenny Seaton. Apologies if I spelt any names incorrectly. I also was on Children’s Channel 7 prob about 1963/4 Taffy the Lion was on. Someone asked me if I had brothers and sisters, I said, ‘No’, only Michael, Cathy, Debbie and David! Ha ha. They also asked me why shouldn’t you swallow chewing gum, I said ‘ because your stomach will stick together ‘ why I I remember this so clearly I don’t know? I remember Carolyn well. Friends and myself went on TVW to play concentration. I was also an East Perth supporter and saw them both at a game. Mr Tannock was a teacher at Mounting Lawley High to from memory. My High School.